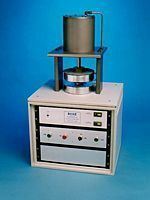 This oscillating disk-cure rheometer, per ASTM D-2084 and ISO-3417, tests elastomeric materials to determine values for viscosity, cure characteristics and temperature at various points in the cure cycle. Computerized testing simplifies and reduces setup, data acquisition and display time. The ODR software prompts the user through each screen, which greatly reduces employee training time. This software builds your data library by compound, batch and test, and stores data, on hard drive or disks, for future analysis. The cure curve is displayed on monitor during test and can be printed after test or recalled and displayed on the screen at a later date. Gate parameters can be set for all data points; any point out of parameter is flagged during test and marked on the test report. This report includes cure curve and torque/time data for all selected points. Statistical analysis is done on all selected data points.